Wow, I did not want to take this off. I think I wore it for two and a half days (and my record is 3), plus neither of my ten nails chipped so there was really no excuse to remove it. I want ten thousand back ups of this. It is like the holographic version of Chanel Lilac Sky. It is the perfect balance between pink and purple, one of those colors that will have you guessing. Is this pink? it looks pink under this light... is this purple?... It is a little chameleon and I love colors like these. 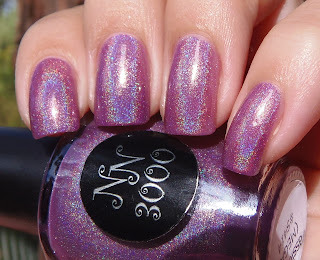 I'm usually more into blue-toned purples (or blurples), but this one is definitely a must have if you are a purple holo hoarder like me. I like your first holo's better. The newer ones don't seem to be as holographic?